The past couple of weeks I have thoroughly enjoyed about a dozen and more tomatoes from the Farmers Market in Lufkin, Texas - and I mean really enjoyed them. They were so good you could just get all tomatoey biting right into the flesh and into the most incredible taste trip down memory lane. Who cares if the tomato juice bleeds down your chin? Nobody is looking, and sometimes it looks just too darn good to even take the time to slice it, not to mention that tasty tomato juice that would leak and waste on the cutting board. Although, slice many of them I did for the best burger around -- a British White grassfed beef hamburger fresh off the grill with home grown tomatoes -- just so good it makes my mouth water thinking about those burgers. We didn't always have fresh tomatoes when I was growing up, but I remember well the summers when we did, and enjoying them so very much. It's not surprising kids these days don't much care for a lot of fruits and vegetables. They don't taste the way they used to! Heck, there are whole generations of young families out there whose parents are clueless about what a tomato ought to taste like. Same goes for a home grown cucumber. I picked up a basket of fresh cucumbers as well, nice small ones, very tasty, and maybe I've invented a new way to eat a bacon and tomato sandwich. 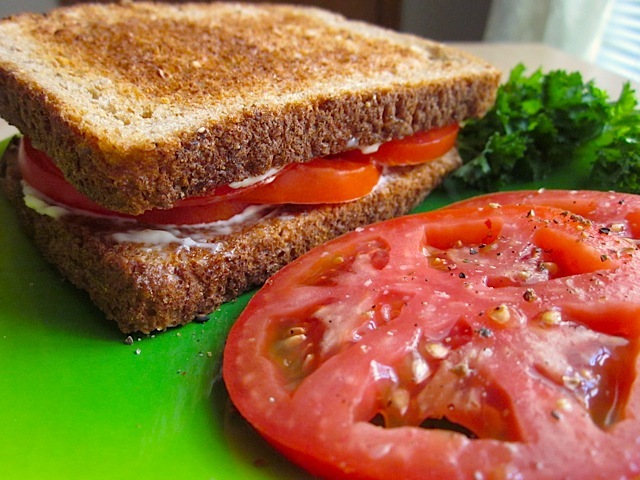 I lengthwise sliced the cucumbers thinly and put them on several bacon sandwiches, along with those home grown tomatoes of course. Talk about an explosion of flavors and an excellent lunch - I'll call it a BCT on Rye sandwich - it was unbelievably good eating. 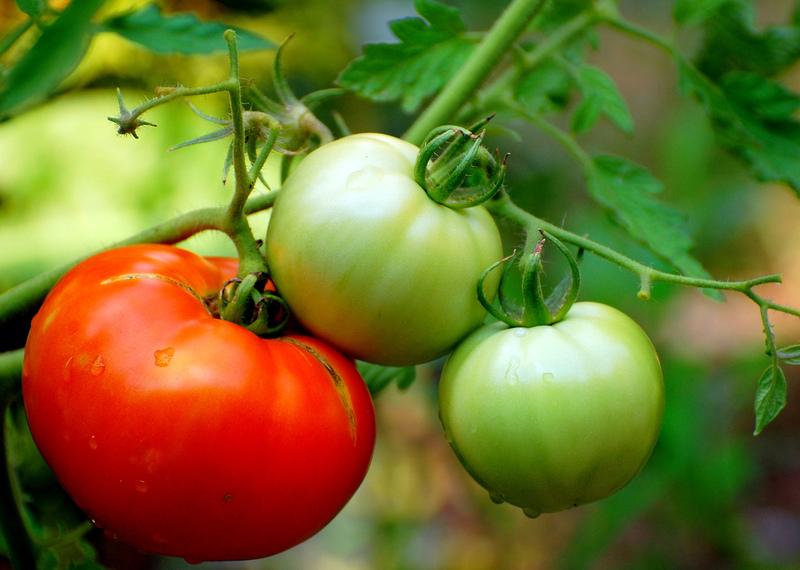 Have you ever wondered just why the tomato at the grocery store just doesn't measure up? About two decades ago, I would put store bought tomatoes that were under ripe in a sunny window to finish ripening for several days - and the taste was vastly improved (though still not the true sweet pleasure of a home grown one). These days, it just doesn't seem to work anymore. Well, perhaps we can chalk it up to progress. I don't know about you, but it never never occurred to me that my tomatoes had been gassed to turn orange. Or jeez, their DNA tinkered with to make them super sturdy thick-skinned growers and world travellers. And just what kind of nutrition is in these frankenstein new tomatoes? I have an antique calorie and nutrition handbook, it's so old it must surely be a collectible by now. I have to wonder if the nutrition profile of the tomato has been updated for the typical frankenstein tomato in modern calculations. Just what is to become of the delectable tomato? What is in store, literally, for the future? I cringe at the thought of further progress in the planting, growing, harvesting - and let's not forget 'gassing' of the awesome tomato. Perhaps our future tomato eating experiences are in the hands of youngsters today who have a love of growing things; who like the magic of planting a seed, nurturing it, and enjoying the natural gift of its flavor and texture. Here is one youngster who has a very green thumb and a love for watching his efforts bear fruit; perhaps our future supper tables will be rescued by kids such as FarmerGrant, whose family has roots in Colmesneil, Texas. Grant has a great love of growing things, and he has several videos on YouTube that track the progress of his new backyard garden in the Houston area. The videos above are his garden early this summer and then in late June -- including lots of tomato plants. Take a look at his other videos (or click on the YouTube icon in the bar at the bottom of the video above) that show the progress of his garden through the summer, and take the time to give him a thumbs up encouragement for his efforts. He's also raising chickens for an FFA project, and has a pet rabbit that helps him out from time to time in his garden -- this remarkable young man will even break a sweat weeding! Now there's a rare youngster in America today. . .
(1) How Industrial Farming 'Destroyed' the Tasty Tomato , by Barry Estabrook, a former contributing editor at Gourmet magazine. He currently blogs at politicsoftheplate.com.